Darren Irvine leads Anside Magneto round the sale ring. Limousin bulls led the charge at the May Stirling Bull Sales achieving the top price of 12,000gn at the two-day event. The sale leader was the champion from the pre-sale show, judged by John Duncan, of Dyke Farm Cottage, Milton of Campsie, Glasgow. This was October 2016-born Anside Magneto from the Irvine family, at Braehead Farm, Drummuir, Keith. An AI son of Powerful Irish, out of Normande Bouquet, he sold to Iain Wilkinson for his Redstroke herd at Balgay, Inchture, near Perth. Next best, at 9,000gn, was the reserve champion from the pre-sale show, November 2016-born Brims Murphy, from Messrs W & A Oag, Achiebeg Farm, Shebster, Thurso. An AI son of Ampertaine Gigolo, out of Brims Allover, he sold to G McCormick Snr, Claggan Farm, Bridgend, Isle of Islay. Thereafter 8,000gn was paid for an entry from mother and daughter duo Mary Fotheringham and Hazel McNee, of Overfinlarg Farm, Tealing, Dundee. This was December 2016-born Westhall Black Man, by Westhall Jammy and out of Westhall Dancer. He sold to W M Patrick, Ballikinrain Farm, Balfron, Stirling. More leading prices were paid for entries from the Irvine family’s Anside herd. At 7,500gn, selling to TL Stirling, Auchterblair Farm, Carrbridge, was Anside Mercury, also by Powerful Irish. Meanwhile, another Powerful Irish son, Anside Murphy, sold for 7,200gn to A Sime & Son, Bruceland, Elgin. Other leading prices included 6,500gn for Springsett Marbles, by Woodroad James, from Dougie McBeath and Sarah Jane Jessop, Lower Greenyards Farm, Bannockburn, Stirling. The buyer was R & D Farquhar, Tewel Farm, Stonehaven. 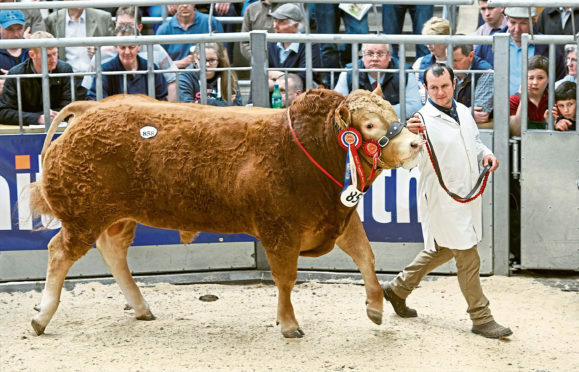 Another at 6,500gn, selling to the Scottish Government’s bull stud at Knocknagael Farm, near Inverness, was Goldies Mighty, by Goldies Fortress, from Bruce Goldie, Townfoot, Mouswald, Dumfries. The bull stud also paid 5,500gn for another Anside bull, Anside Morris, also by Powerful Irish. Meanwhile, three lots sold for 6,000gn. First at this price, selling to Thomas Meiklem & Sons, of Lochran Farm, Blairadam, Fife, was Whinfellpark Mozart, by Trueman Jagger, from Messrs Jenkinson, Clifton Moor, Penrith, Cumbria. The second lot at 6,000gn was another entry from Messrs Jenkinson – Whinfellpark Macdonald, by Lowerffrydd Empire. The buyer was W Steel & Co, Cumberhead, Lesmahagow. The last entry at 6,000gn was Maraiscote Nibbler, by Corlea Jetset, from J Nimmo, Bogside Farm, Newmains, Wishaw. The buyer was AM Bell & Co, Towie Farm, New Aberdour. Females sold to a top 2,200gn twice. First at this price was Grahams Linsey from the Graham family at Airthrey Kerse Dairy Farm, Bridge of Allan, selling to K Mackay, Upper Ardnagrask, Muir of Ord. The other was Lomond Nancy, from Andrew Orr, Lomondmuir Farm, Wester Balgedie, Kinross, selling to W & M Redpath, 5 East Pitcorthie, Anstruther. In all, a 92% clearance rate was achieved for bulls when 44 lots sold to average £4,928, which is up £903 on last year’s fixture.